Inconceivable! a custom deck of unique playing cards based on the princess bride. This deck contains 54 custom cards manufactured by the USPCC. 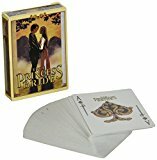 Unique court cards, gaffs, and jokers bring the princess bride move to life right in your hand.